After seeing swift results on their website, our clients at www.sparteccomposites.com referred us to their friends at Access Industrial. They contacted us to redesign Access Industrial website and to give it a complete new look. We created a simple, bright and informative website. It was created with CMS (Content Management System), allowing the client to update their service, images and any other information as often as required. Access Industrial is a team of dedicated professionals specializing in providing Industrial Grade Structures for Corrosive Environments. they can provide you with turnkey solutions in Fiberglass, Aluminum and Stainless Steel Access Equipment suitable for service in the Waste Water, Mining, Pulp and Paper, Pharmaceutical and the Chemical Industry. 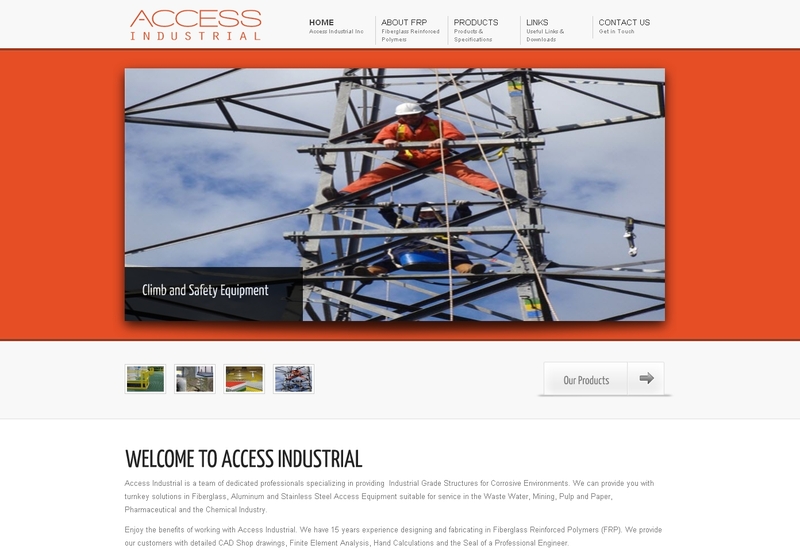 We are pleased to launch www.accessindustrial.com and had amazing time working on this project. We’ll like to take this opportunity to thank our clients for choosing us and trusting us with the most important part of their online presence. Is your website in need of a redesign? Not sure, read the advantages of a website redesign or contact Kinex Media a website design Toronto company for free consultation.